After Theresa May's defeat Parliament remains fundamentally split over what form of Brexit would be best for Britain. Despite the huge defeat the agreement may still be on the table in an amended form as Mrs May seeks cross-party talks for "genuinely negotiable" solutions she can take to Brussels. From the start of the Brexit process, Mrs May had insisted that she wanted a "bespoke" deal tailored specifically for the UK and not an off-the-shelf model shaped around arrangements offered to other trading partners. The Withdrawal Agreement reached in November guarantees the rights of UK citizens currently living in the EU27 states and European nationals in Britain, settles the UK's outstanding liabilities to Brussels budgets for a payment of around £39 billion and takes Britain out of the EU single market and customs union, the common agriculture and fisheries policies and the jurisdiction of the European Court of Justice. Alongside this is a Political Declaration agreed by the UK and EU27, setting out a common determination to forge a close future relationship in areas such as trade and security. If this cannot be secured by the end of the transition in December 2020, the period can be extended by a further two years. If the transition concludes without a deal, the so-called "backstop" must be triggered, keeping the whole UK in a customs union with the remaining EU to prevent a hard border in Ireland. If no alternative to Mrs May's deal is agreed, the default option is for the UK to leave the EU without a deal on March 29. This would mean there would be no transition period, and individuals and businesses would have to adapt immediately to new arrangements. 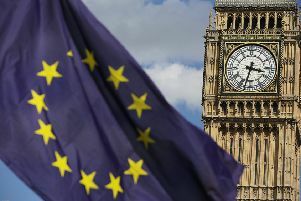 Brexiteers argue that the UK could save its £39 billion "divorce bill" by leaving without a deal, but this could be challenged by the EU in the courts. Critics say that the model would severely restrict access to European markets for the UK's vital service industries - particularly the financial sector. But the option's fans say services could be included in what they term a Canada-plus-plus-plus deal. Trade with EU neighbours would continue to be free of tariffs and non-tariff barriers under single market rules, and UK and EU nationals would retain the right to work and settle in one another's countries. The UK would keep its seat in the EU's decision-making bodies and hasty arrangements would have to be made for the election of MEPs in May. The UK would be subject to ECJ rulings and would continue to make contributions to Brussels budgets, currently running at around £9 billion a year net, but the "divorce bill" would no longer be payable. Future trade deals would be made as part of the EU bloc and not bilaterally.